The cruellest persecution the Romani people have ever suffered took place during the period of Nazism in Europe. With Hitler leading Germany, the continent’s Romani population was systematically exterminated. Some sources speak of 250,000 people, while others mention figures exceeding 500,000. Although many documents about this genocide were destroyed after World War II, sufficient data exist today to confirm that, after the Jewish people, Roma were the second hardest hit by Nazi racial ideas. On 10 February 1941 Hitler called Roma “the biggest scourge of the rural population”. However, discrimination against the Romani community in Germany had begun many years before the Nazi Party had come to power. The chronology of facts as told by Roma to the international community in recent decades (which has not always been studied sufficiently) should at least provide fuel for reflection. Influential in this country were the lectures held in 1890 on Zigeunergeschmeiss, which literally means “Gypsy scum”. Nine years later, the Bavarian police created a special unit for Romani affairs as well as a central office to “combat the Gypsy plague”. In 1909, the same German police force suggested that Romani people should be branded with hot irons in order to facilitate their identification. Even more sinister was the suggestion by doctors Karl Binding and Alfred Loche in 1920 that Roma should be sterilised and eliminated as a population. Hitler adopted the same idea in 1933, when the Nazis passed a law to regulate the eugenic sterilisation of “brown-skinned Germans”, which at that time referred to the Romani population as well as Afro-German citizens who were the descendants of unions between African soldiers and European women during World War I. The diabolical Nazi laws against Roma were implemented in January 1934, when certain Roma were selected to be sterilised via injection or castration at the Dachau, Dieselstrasse, Mahrzan and Vennhausen concentration camps. At a later stage they were transferred to other concentration camps such as Bergen-Belsen, Buchenwald, Mauthausen and Sachesenhausen. That same year Germans were forbidden from marrying Jews, Roma and blacks. A few months later, following enactment of the Nuremberg Law of 15 September 1936, Roma “in defence of German blood and honour” lost their rights as citizens and their children were banned from attending schools. 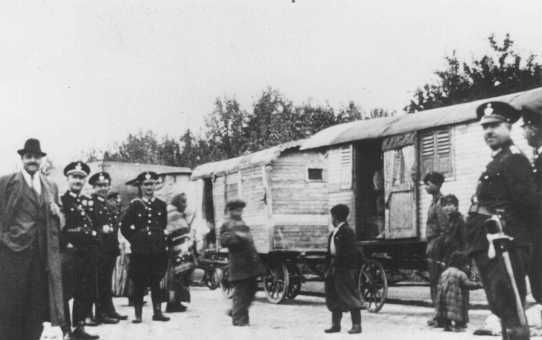 Ethnic cleansing reached horrific levels between 12 and 18 June 1938, a period known as the “Gypsy clean-up week” when hundreds of German and Austrian Roma were arrested and imprisoned. On 8 December 1938 a decree was enacted to definitively combat the “Gypsy plague”, in the discriminatory jargon most used during the Nazi regime to refer to Roma. In 1939, at the outbreak of World War II, the Nazi Party created the Office of Racial Hygiene, a pseudoscientific body which published a decree specifying that “all Roma should be treated as inherently ill, and the only solution is to eliminate them”. In early 1940, the first mass killing of Romani people took place. In January 1940 a group of 250 Romani children were used for medical experiments at the Buchenwald concentration camp. They were given cyanide in gas form to see how long it would take them to die. This was the first chapter of what was to be an unstoppable process of extermination. On 31 July 1941 the Reich Main Security Office decreed the start of the Final Solution. The systematic elimination of all Jews was begun. Roma and other groups such as homosexuals, Jehovah’s Witnesses, leftist dissidents as well as physically and mentally disabled people were also targeted. Original article of Journal SAPIENS no. 87.